My garden has expanded since the last update. 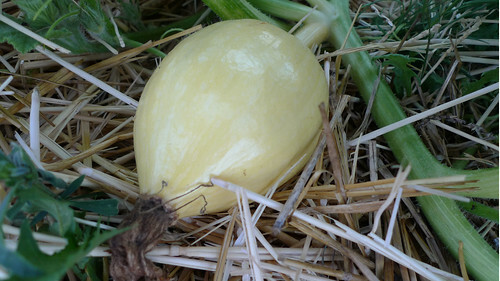 I haven't planted anything new, my pumpkins just started taking over the yard. 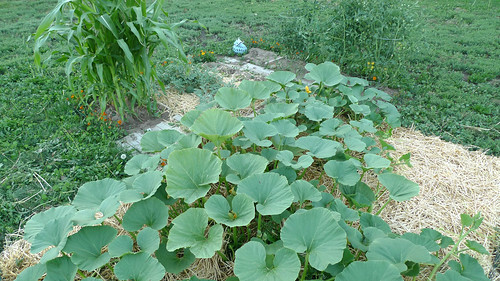 Every few days I have to turn the pumpkin vines back in towards the garden, I hope they don't outgrow their area again. So far there are a few pumpkins that are a bit larger than my hand. 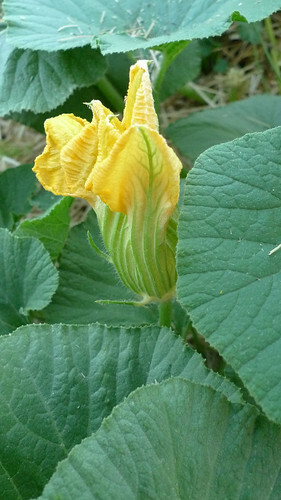 There are also more pumpkin blossoms popping up all the time. The bees love these pumpkins! Unfortunately these pests also love the pumpkins. I thought I had gotten rid of them all, but they are back. 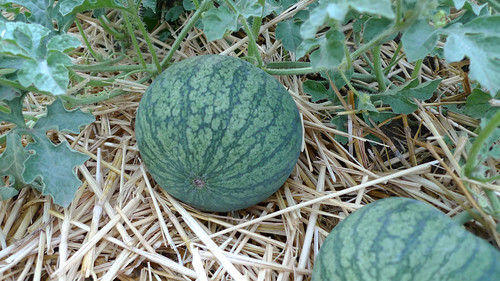 The watermelon are doing pretty well too, their vines aren't quite as out of control as the pumpkins though. The tomatoes have grown enough to tell which is which. I was wrong with my guess; they are Green Zebra, Belize Pink Heart, then Lollipop. 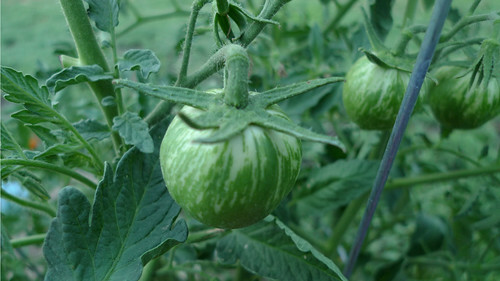 The Green Zebra tomato plant is the smallest of the three varieties, I am not sure if it is this particular plant or if they generally don't grow as much as other tomato plants. 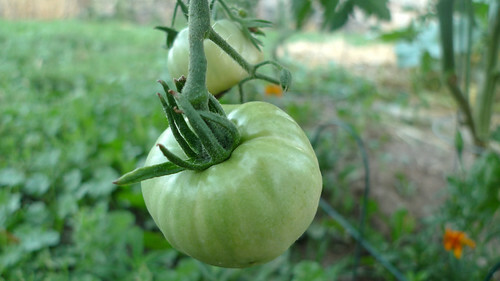 The Belize Pink Heart tomato plant was the largest of the three plants at first, but the Lollipop tomato plant is possibly larger now. They are both way too big for their cages. 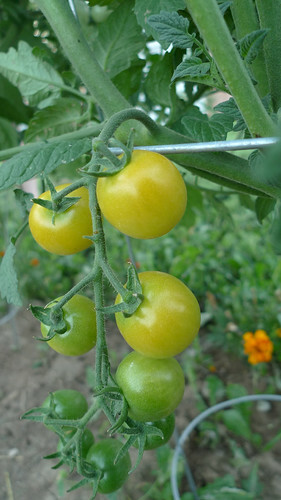 Some of the Lollipop tomatoes are ready to be eaten. I was going to pick the two yellowest of the bunch last night, maybe I will eat them in my lunch today. 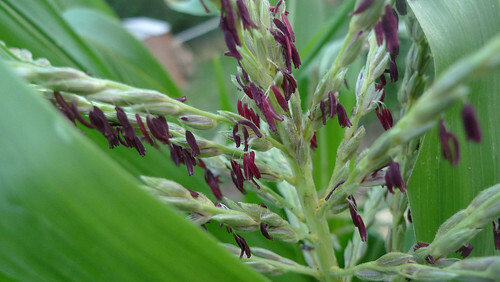 The corn is getting so tall and they have tassels! When I first noticed the tassels a few days ago, I thought they were infested with bugs. I was definitely relieved to see I didn't have another bug problem and quite pleased to see the pretty red pollen grains. I am so excited my garden is doing so well!